Experience the ultimate Colorado life style just minutes from DTC. Panoramic mountain views, abundant wildlife, 16 miles of private trails. Enter this custom home through double knotty alder doors to find knotty alder thoughtfully designed throughout home. Floor to ceiling windows in Great Room to draw you to the expansive views of the entire front range. Great Rm opens to gourmet kitchen w/ durable quartz counter tops. French doors opening to the covered deck lend to easy entertaining. Main floor M suite w/cozy heated tile in the luxurious fully appointed master bath. Unique sun rm/office w/tranquil views of Dawson Butte. Two main floor B/R w/ custom designed artistic full bath. Spacious downstairs includes a decadent second M/suite, custom antique vanity, wk-in closets, kitchenette, wet bar, wine closet, exercise rm/theater/game rm. Insulated heated wk shop, barn, drive thru garage, fenced pasture. 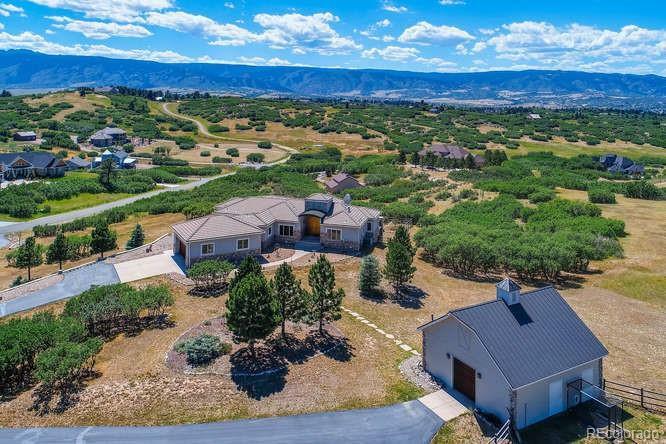 Paved, south facing driveway leads to this stunning, one of a kind, CO DREAM HOME! Association Name Primary Lcm Property Management Inc.